VBA Protection Password for Excel quickly recovers passwords for protected VBA projects in all Office applications including Excel, Word, Outlook and PowerPoint. The VBA Protection Password recovery program swiftly recovers VBA (Visual Basic for Applications) passwords of any length and complexity. VBA Protection Password for Excel recovers passwords and provides access to Office VBA projects automatically. Upon recovery, the password can be copied to the clipboard, stored and used to unprotect the VBA project. Recovers VBA project protection passwords for Microsoft Word, Excel, PowerPoint and Outlook files. Supports all versions of Microsoft Office including 2007/2010. 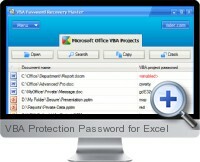 Instantly recovers VBA passwords of any length and complexity. Allows to copy recovered VBA password to the clipboard.